Information made available on this page has numerous sources and contributors. Thanks to Robyn, Fox1013, goatie, Terra Stoddard, www.gbdesigns.com/freaksandgeeks, www.freaksandgeeks.com, www.astro.umd.edu/~fleming/, www.mightybigtv.com. Photos from www.nbc.com/freaksandgeeks. "Freaks and Geeks" not on TV tonight? Take that now-empty hour on Monday Night (or any other time) and use it to join the viewer based letter writing campaign to keep "Freaks and Geeks" alive and kicking. 2. Write to the sponsors of "Freaks and Geeks"
"Freaks and Geeks" isn't on this Monday night . It won't be on next week either. In fact it looks as if it won't be on again until March 13th. Why isn't it on? Well NBC in its infinite wisdom [ahem] pulled the show from sweeps month (again!) and replaced it with episodes of "Twenty-One" and "10th Kingdom." NBC's lack of faith in this critically acclaimed new series may spell doom for "Freaks and Geeks" - and it may never get a shot at a second season! The good news is that the show hasn't been cancelled yet - there is a shot at keeping it on TV but it will require significant viewer participation. THIS MEANS YOU! "Freaks and Geeks" has a good track record of viewer campaigning - although NBC pulled the show from the Fall Sweeps - viewer response got a relaunch of the show and a better timeslot. If you are a fan of "Freaks and Geeks" now is the time to pull out all of the stops to show your support. That's why we created this web site - to let NBC know that we want our "Freaks and Geeks." As above always handwrite your letters if possible, keep your letters polite and to one page! Tell NBC [or whomever you are writing] about yourself and that you enjoy watching "Freaks and Geeks" If your family and friends watch the show tell NBC that too! Tell NBC what you like about "Freaks and Geeks". - the story line - is it meaningful, nostalgic, accurate portrayal of the 80s, high school, etc. - the episodes - do you have a favorite one? If so tell NBC which one and why you like it. Tell NBC about your concerns but end on a positive note! 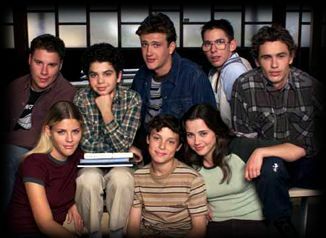 Assure them that "Freaks and Geeks" in your opinion has the potential to be a successful, long-running show with a dedicated viewer-base. Tell them that you are looking forward to a lengthy relationship with the show as its characters navigate their way through high school. Thank them for taking the time to read your letter!  Write the show BEFORE it is cancelled.  Write to NBC, local NBC network-affiliates [find your local NBC affiliate by clicking on the map available at http://www.nbc.com/stations/index.html], sponsors , local and national entertainment media, etc.  Send handwritten letters preferably in blue ink. Handwritten letters carry more weight than typed and lots more weight than just email.  Handwrite the address on the envelope.  Keep your letters friendly and polite (hate mail is simply thrown away).  Voice your concern in a positive way!  Write your letter as an individual - your letter will carry more weight if it appears to be sent from an individual.  Keep you letters short and to the point - one page maximum!  Include the demographic information networks value such as your age, job, number of children etc., ex. "I am a 41 year old astrophysicist who enjoys watching "Freaks and Geeks" with my three teen-aged children..." or "I am a 15 year old student who enjoys watching "Freaks and Geeks" with my parents and my younger sister..."
 End with a positive statement.  If you send letters or email to NBC network affiliates or the media be sure to bcc or cc (carbon copy) the same letter to NBC (and be sure they know that they have been cc'd).  Don't write "Freaks and Geeks" on the envelope. It may be filed away without being read!  Don't type your letter or the address on the envelope. We don't want to look like a computer generated mass-mailing - we want to look like regular concerned folks!  Don't be abusive, hostile, threatening, rude, obscene, etc. Hate mail will be thrown away without being read or counted! 4288 W. Dublinn Granville Rd. New Line Cinema "BOILER ROOM"
Now get to work and save the show!!! Write to the sponsors of "Freaks and Geeks"
keep your letter very short and about the sponsor! Without the generous help of "goatie" this list of sponsors would never have come into existence. Thank You! Phase Three has two parts - you can write to the big guns in the entertainment media and ask them to feature the cast of "Freaks and Geeks" on their show, cover, news, etc., as well as explaining to them why you think the show is the best and why it deserves their attention. Thank them for positive coverage and ask for a F&G cover. -TV Guide- one of the "best new shows"
-a TV Guide article that mentions F+G as "among the few network offerings to draw high praise from advertisers"
Remember: to be considered for publication, letters must contain the author's name, address and daytime telephone number. Please thank these people for writing about "Freaks and Geeks"
50 W. San Fernando St. The Arizona Republic 09/03/1999 The Arizona Republic Dave Walker 1999, Phoenix Newspapers, Inc.
" The best new show of the season is in danger of cancellation. It's time to mobilize." Information made available on this page has numerous sources and contributors. Thanks to Fox1013, goatie, Terra Stoddard, www.gbdesigns.com/freaksandgeeks, www.freaksandgeeks.com, www.astro.umd.edu/~fleming/, www.mightybigtv.com. Photos from www.nbc.com/freaksandgeeks.